In addition to form factors, memory technologies, and error checking methods, there are several other specifications important to understanding and selecting memory products. The speed of memory components and modules is one of the most important factors in optimizing a memory configuration. In fact, all computer systems specify a memory component speed. Ensuring memory compatibility requires conforming to this specification. This section covers three measurements of memory component and module speed: access time, megahertz, and bytes per second. Prior to SDRAM, memory speed was expressed by access time, measured in nanoseconds (ns). A memory module’s access time indicates the amount of time it takes the module to deliver on a data request. So, smaller numbers indicate faster access times. Typical speeds were 80ns, 70ns, and 60ns. Very often, you can identify the speed of a module by the part number on the chip: such part numbers end in “-6” for 60ns, “-7” for 70ns, and so on. In most cases you can conform to a computer system’s memory specification with a module rated at the required speed or faster. For example, if your system requires 70ns memory, you can use both 70ns and 60ns memory without a problem. However, some older systems check the module ID for the rated speed at system-boot up, and will only boot up if they recognize the exact speed they are looking for. If the system has an 80ns speed specification, for example, it won’t accept anything different than 80ns, even if it is faster. In many cases, modules could still be built for these systems with faster memory chips on them, but the ID on the module would be set at the slower speed to insure compatibility with the system. This is why you can’t always be sure of the rated speed on a module by looking at the speed markings on the memory chips. Beginning with the development of SDRAM technology, memory module speed has been measured in megahertz (MHz). Speed markings on the memory chips them-selves are typically still in nanoseconds. This can be confusing, especially since these nanosecond markings no longer measure access time, but instead measure the number of nanoseconds between clock cycles. For SDRAM chips with speeds of 66MHz, 100MHz, and 133MHz, for example, the corresponding marking on the chips are -15, -10, and -8, respectively. This table shows the method for determining speed equivalencies between MHz and ns ratings. As noted in a previous section, the speed of the processor and the speed of the memory bus are normally not the same. The speed of memory is limited by the speed of the memory bus, which is the slowest link in the process. Converting MHz to bytes per second can be confusing at first. The two most important pieces of information you need to make the conversion is the speed (in MHz) and the width (in bits) of the bus. Bus Width: If you have an 8-bit bus, then 8 bits, or 1 byte of information at a time can travel on the bus. If you have a 64-bit bus, then 64-bits, or 8 bytes of information can travel at a time. Bus Speed: If the memory bus speed is 100MHz, this measures 100 million clock cycles per second. Typically, one packet of information can travel on each clock cycle. If the 100MHz bus is 1 byte wide, then data can travel at 100 megabytes per second. Data travels on a 100MHz, 64-bit bus at 800 megabytes per second. Rambus modules are sometimes measured in MHz and sometimes measured in megabytes per second. One type of Rambus module runs on a 400MHz bus, but because Rambus modules can send two pieces of information per clock cycle instead of one, the module is rated at 800MHz. This is sometimes referred to as PC-800. Because the Rambus bus width is 16-bit, or 2 bytes wide, data travels at 1600MB per second, or 1.6GB per second. Using the same logic, PC-600 Rambus transfers data at 1.2 gigabytes per second. Registers and buffers improve memory operation by “re-driving” control signals in the memory chips. They can be external to the memory module, or they can be located on the module itself. 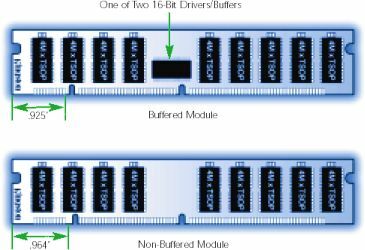 Having registers and buffers placed directly on the memory module, enables a system to support a greater quantity of modules. So, you’re likely to find these types of modules in servers and high-end workstations. It is important to note that when upgrading, unbuffered and buffered (or registered) modules cannot be mixed. Buffering (EDO and FPM): For EDO and fast page modules, the process of re-driving the signals is called buffering. With buffering there is no loss of performance. Registering (SDRAM): For SDRAM, the signal driving process is called registering. Registering is similar to buffering, except that in registering, the data is clocked in and out of the register by the system clock. Registered modules are slightly slower than non-registered modules, because the registering process takes one clock cycle. An example of a buffered and a non-buffered module. They are keyed differently, to ensure that they can’t be used in place of one another. A multiple-banked module allows more flexibility in type of chips used. Multiple banking allows a memory designer to divide the module into banks, which means it can appear to the computer system to be more than one module. This design is equivalent to the banks of memory sockets in a computer: the system accesses one bank of memory at a time, regardless of how many actual memory sockets comprise a bank. Some people confuse the terms “double-sided” and “dual-banked”. To clarify: Double- sided is a physical term meaning that chips are arranged on two sides of the memory module. Dual-banked is an electrical term meaning that the module is divided electrically into two memory banks. Memory modules are manufactured with either tin leads (connectors) or gold leads. Gold is a better conductor than tin. However, because tin is much less expensive than gold, computer manufacturers began using tin sockets on system boards in the early 1990s to reduce their costs. If you’re buying memory and you have a choice - that is, compatible modules come in both tin and gold - it’s best to match the metal of the module to the metal of the socket it will be going into. Matching metals can help avoid corrosion. Kingston’s policy has always been to match metals, so Kingston part numbers assigned to each computer system take the socket metal into account. Refresh is the process of recharging, or re-energizing, the “memory cells” in a memory chip. Internally, computer memory is arranged as a matrix of memory cells in rows and columns - like the squares on a checkerboard - with each column being further divided by the I/O width of the memory chip. The entire organization of rows and columns is called a DRAM array. DRAM is called “dynamic” RAM because it must be refreshed, or re-energized, thousands of times each second in order to retain data. It has to be refreshed because its memory cells are designed around tiny capacitors that store electrical charges. These capacitors work like very tiny batteries that lose their stored charges if they are not re-energized. Also, the process of reading data from the memory array drains these charges, so the memory cells must also be pre-charged before reading the data. Cells are refreshed one row at a time (usually one row per refresh cycle).The termrefresh rate refers not to the time it takes to refresh the memory but to the total number of rows that it takes to refresh the entire DRAM array. For example, a refresh rate of 2K indicates that it takes 2,048 rows to refresh the array; likewise, a 4K rate indicates 4,096 rows. Normally, the system’s memory controller initiates the refresh operation. But some chips are able to “self refresh.” This means that the DRAM chip has its own refresh circuitry and does not require intervention from the CPU or external memory controller. Self-refresh modules dramatically reduce power consumption and are often used in portable computers. The term CAS latency refers to the number of clock cycles it takes before a column can be addressed on the DRAM chip. Latency is a measure of delay, so a “CL2” CAS latency factor indicates a two-clock cycle delay, and a “CL3” latency factor indicates a three-clock cycle delay. When SDRAM chips first came out, it was difficult to produce chips with a CAS latency factor as low as CL2. And although some specifications called for CL2, many modules worked fine at a CAS latency factor of CL3. As memory components get faster, chips become more dense and more circuits get squeezed onto smaller boards. Dissipation of excess heat becomes more of an issue. For several years now processors have incorporated fans. Newer memory module designs use heat sinks or heat spreaders to maintain safe operating temperatures. When a computer system boots up, it must “detect” the configuration of the memory modules in order to run properly. Parallel Presence Detect is the traditional method of relaying the required information by using a number of resistors. PPD is the method SIMMs and some DIMMs use to identify themselves. Serial Presence Detect uses an EEPROM (Electrically Erasable Programmable Read-Only Memory) to store information about the module. An EEPROM chip (also known as an E2PROM) differs from an EPROM in that it does not need to be removed from the computer to be modified. However, it does have to be erased and reprogrammed in its entirety, not selectively. It also has a limited lifespan - that is, the number of times it can be reprogrammed is limited. SDRAM memory requires that clock lines run from the system clock to the memory module. “2-clock” means there are two clock lines running to the module, and “4-clock” means there are four clock lines running to the module. The first Intel designs were 2-clock because there were only eight chips on the module. Later, 4-clock designs were developed, which allowed for fewer chips per clock line, thereby decreasing the load on each line and enabling a quicker data interface. Voltages on memory modules keep decreasing as memory cells in DRAMs get closer together and heat becomes more of an issue. Most computer systems used to operate at a standard of 5 volts. Compact notebook computers were the first to use 3.3-volt chips. This was not only because of heat issues; since lower voltage chips use less power, using them made it easier to prolong battery life. Now most desktops are standardized on 3.3-volt memory as well, but this is quickly being replaced by 2.5 voltage chips as products continue to get smaller and components closer together. Composite and non-composite were terms first used by Apple Computer to explain the difference between modules of the same capacity that used a different number of chips. To illustrate: when the industry is transitioning from one chip density to another, there is normally a stage where you can build, for example, a memory module with 8 of the new density chips, or 32 of the old density chips. Apple referred to the module using the latest technology and fewer chips as “non-composite”, and the version using earlier technology and greater number of chips as “composite”. Because 32 chips on a module can cause heat and spacing problems, Apple would often advise customers to buy non-composite modules.